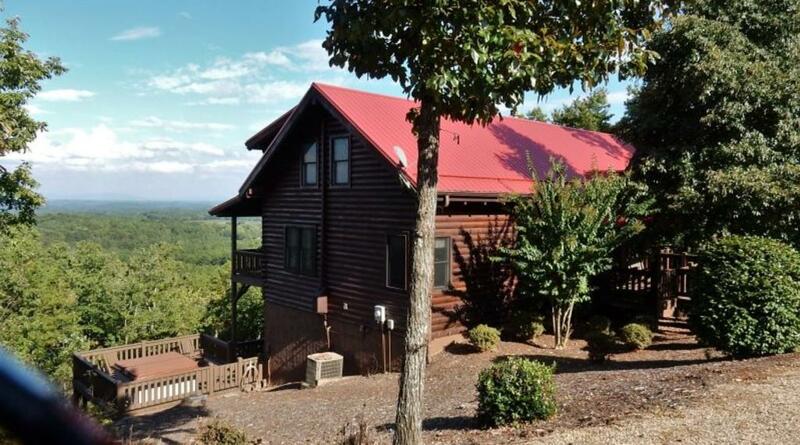 Cooper’s Cabin is a lovely log home is located in The Peaks, a gated subdivision with privacy, acreage, and breathtaking long-range mountain views. It provides an amazing backdrop for the next family photo album (four-legged members welcome). 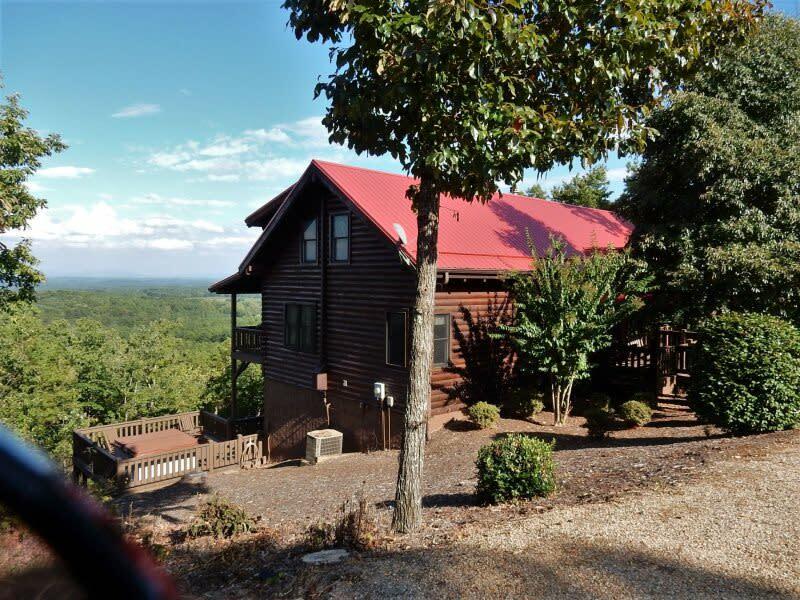 There is even a hot tub available year round plus a game room and internet. Tranquility and Entertainment Cooper’s Cabin offers an escape from the monotony of your everyday routine without compromising the comforts of home. Plus, it has amenities you wish were in your home. Outdoor Comfort When you walk up to the covered front porch and chunky wood rocking chairs beckon you to take a seat. This is a great place to relax with morning coffee or a book in the afternoon. There are multiple decks with comfortable seating (covered and open) that overlook the exquisite landscape as well as shaded and full-sun areas on the property. Main Floor Living Step inside to the large foyer area and stairs that lead to the upper level. Wood and tile flooring is throughout the home. Just past the foyer sofa table is the cozy living area. It has a gas-log fireplace (for cold-weather use), flat-panel television that includes DirecTV (Starz Package), ample seating, and easy access to the spacious decks. To the right is the dining area and just beyond is the the fully-equipped kitchen (dishwasher, refrigerator, coffee maker, toaster, microwave, and more). Dine in or outdoors in the fresh mountain air. There is a gas grill on the deck, picnic table, and comfortable chairs. Also on this level is the master bedroom with king-size bed and adjoining private bathroom, complete with vanity and separate water closet with lavatory, shower, and jetted tub. The washer and dryer are located in a master bedroom closet. Upper Level Relaxation Head upstairs to the loft that overlooks the foyer area. Here you will find a desk, over-sized chair with ottoman, large window, and telescope for an even better view of the natural beauty of this area. Also on this level are 2 bedrooms: 1 with a queen bed and, across the hall, is a bedroom with 2 full beds. There is full bathroom upstairs as well. Lower Level Fun The lower level is the indoor entertainment space, complete comfortable seating, game table, checker set, pool table, ping pong table, and Foosball. This is a great space for the kids and/or your opportunity to stake your claim as the family game champion.